Less than 3% of Indias population is Christian, but we have seen Christmas decorations everywhere we have been in the last few days (in Kerala and Tamil Nadu). The most popular decoration seems to be a lighted paper or plastic star, and they are for sale and are displayed everywhere. Christmas music is heard in Internet cafes and hotel lobbies. 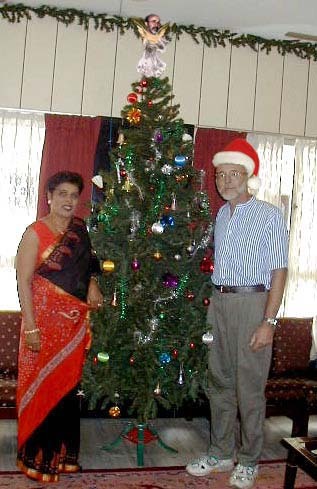 The tree in the picture is in the lobby of the Hotel Pandian in Chennai, but Rita and I will be in Bangalore for Christmas. We would like to wish you a joyous and peaceful holiday season wherever you may be. Best wishes to you all for a happy holiday season from your webmaster as well!